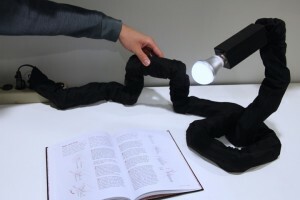 The Tangible Media Group at MIT Media Lab has come up with a novel and interesting interactive robotic interface called LineFORM. The project, consisting of a series of servos and some well considered firmware, was designed as an exploration of the utilization of a line as an interactive device. The line changes form to either act as an input device, to represent some form of data, or act as an intelligent appliance. This design is deceptively simple, allowing many complex interactions. Check out the video and think about what you could do with a series of Dynamixels!